Jordan Gozdzialski, M.D., and Walker Thomas, sonographer, perform an echocardiogram on a gorilla at Omaha's Henry Doorly Zoo and Aquarium. It was a day just like any other, and Walker Thomas, UNMC Department of Anesthesiology sonographer, was about to perform an echocardiogram on a patient. Thomas packed up the Phillips CX50 portable ultrasound machine and drove to Omaha's Henry Doorly Zoo and Aquarium. His next patient? A 24-year-old, 390-pound gorilla named Sampson. "Gorilla hearts look very similar to human hearts," Thomas said. "They can develop heart disease just like humans. Once you know what you're looking for, you can do a basic echocardiogram like you can on a human." UNMC has supplied supplemental health care expertise since 2007 to certain zoo and aquarium animals in need of specialized care. Nearly all animal medical care at the zoo is provided by on-site veterinarians, but some preventive health care requires specialized equipment and expertise, such as the portable ultrasound machine Thomas uses. Heart images of the gorillas are submitted to the Great Ape Heart Project, which monitors the heart health of captive great apes around the nation. Great apes include gorillas, orangutans, chimpanzees and bonobos. 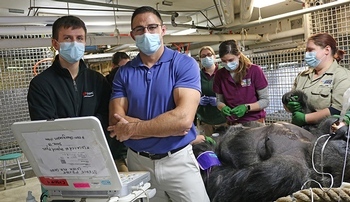 Cardiac disease is the leading cause of morbidity and mortality in male gorillas housed in zoos and occurs in the wild with an unknown prevalence. Five of the six adult male gorillas currently housed at the zoo are being treated for cardiac abnormalities. "Anytime we put an animal under general anesthesia we do as many diagnostics as possible while we have hands-on access to avoid having to immobilize again in the near future," said Julie Napier, senior veterinarian at Omaha's Henry Doorly Zoo and Aquarium. This can include, but is not limited to, a physical exam including auscultation of the heart and lungs, and checks of the eyes, ears, teeth, skin, nails, haircoat, and temperature, an ultrasound to evaluate abdominal organs, obtaining urine by cystocentesis, a TB test, and phlebotomy for complete blood count and chemistry. These procedures also provide an opportunity to gather data for research projects as requested. "Fortunately, due to excellent training by the supervisor of the gorillas and her staff, we immobilize our gorillas much less frequently, and when we do immobilize, we use a protocol that was developed by a veterinary anesthesiologist," Napier said. "There are always risks with anesthesia, but the protocol we use is extremely safe. We've been immobilizing our gorillas for echocardiograms since 2007 and have not had a complication to date." Not all heart images are captured under anesthesia. Most of the great apes are trained to stand and press their chest against an enclosure with their arms outstretched so that a sonographer can apply a probe to their chest for scanning. This reduces the instances in which an ape has to undergo anesthesia. Napier said each great ape gets an echocardiogram about every 18 months, but only goes under anesthesia once every three to five years depending upon their health. Echocardiograms performed under anesthesia provide opportunity for a better look at the heart, because the sonographer can maneuver around their thick chest pad. Completed scans are read by cardiologists at the Great Ape Heart Project as well as Tom Porter, M.D., director of the Echocardiography Laboratory at UNMC/Nebraska Medicine. "It's an honor to have a part in maintaining the health of these animals," Thomas said. "These two major institutions in our community are collaborating to make a better world for these great apes."